Stuffed peppers are sure to please everyone, including the kids. 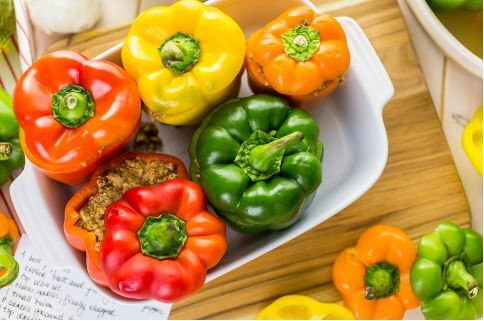 Bell peppers are packed with Vitamin C and also contain B V6 which is a vital nutrient for everyone. They are filled with flavor and can be made to enjoy for lunch or dinner. Enjoy! In a large skillet, heat the grape seed oil over medium heat. Brown the ground turkey until cooked through and no longer pink. Add the spinach and stir until wilted. Add the next 6 ingredients (mushrooms through oregano) and stir. Add sea salt and freshly ground black pepper to taste. Simmer for 20 minutes. Cut the tops off of the peppers and remove the seeds and stems. Slice each pepper in half lengthwise. On a large baking sheet, place peppers cut side up. Stir rice into turkey mixture and fill each pepper. Bake for 25 minutes and serve warm.